Oxford University Press, USA, 9780198805038, 272pp. Fluid Mechanics: A Geometrical Point of View emphasizes general principles of physics illustrated by simple examples in fluid mechanics. Advanced mathematics (e.g., Riemannian geometry and Lie groups) commonly used in other parts of theoretical physics (e.g. General Relativity or High Energy Physics) are explained and applied to fluid mechanics. This follows on from the author's book Advanced Mechanics (Oxford University Press, 2013). 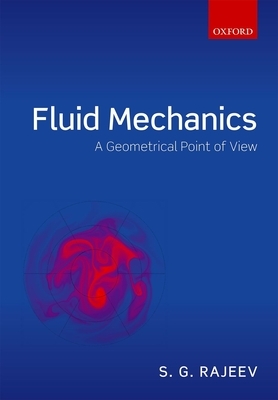 After introducing the fundamental equations (Euler and Navier-Stokes), the book provides particular cases: ideal and viscous flows, shocks, boundary layers, instabilities, and transients. A restrained look at integrable systems (KdV) leads into a formulation of an ideal fluid as a hamiltonian system. Arnold's deep idea, that the instability of a fluid can be understood using the curvature of the diffeomorphism group, will be explained. Leray's work on regularity of Navier-Stokes solutions, and the modern developments arising from it, will be explained in language for physicists. Although this is a book on theoretical physics, readers will learn basic numerical methods: spectral and finite difference methods, geometric integrators for ordinary differential equations. Readers will take a deep dive into chaotic dynamics, using the Smale horse shoe as an example. Aref's work on chaotic advection is explained. The book concludes with a self-contained introduction to renormalization, an idea from high energy physics which is expected to be useful in developing a theory of turbulence. S. G. Rajeev, Professor of Physics and Mathematics, University of Rochester S. G. Rajeev was born in Trivandrum, India. He has a B.Sc. degree from the University of Kerala and a Ph. D. from Syracuse University. After a stint as a Postdoctoral Fellow at MIT, he has been on the faculty at the University of Rochester, where he is a Professor of Physics and of Mathematics. He has done research on several topics in high energy physics and quantum gravity: soliton models for hadrons, string theory, renormalization, quantum field theory, and Yang-Mills theories -- but fluid mechanics was his first love.